Evolver, Inc., a technology company and provider of secure eDiscovery solutions, announced today that they have completed implementation and testing of their primary eDiscovery software, kCura’s Relativity, running on the flexible, scalable Amazon Web Services (AWS) Cloud. This process included efforts from both Evolver’s infrastructure and application development teams over the past 18 months. Evolver is a leading provider of secure eDiscovery solutions for law firms and corporations. Evolver deploys Relativity in both on-premises and cloud environments offering clients a scalable and secure infrastructure, which has been specifically tailored for complex eDiscovery requirements. 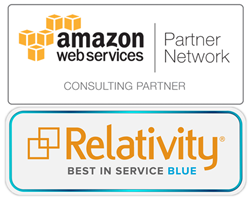 Evolver has been a Relativity Premium Hosting Partner since 2009 and recently achieved kCura’s Relativity Best in Service designation. In addition, they are an Amazon Partner Network (APN) Amazon Web Services (AWS) Standard Consulting Partner and Channel Reseller Partner. The AWS Cloud allows for dynamic scaling of IT infrastructure to meet the immediate needs of clients. It can be scaled up or down on a real-time basis based on demand, thereby only utilizing the infrastructure resources required for the current tasks at hand. Clients can reduce their in-house IT resource management and cost of eDiscovery by only purchasing the infrastructure and services they require for a specific matter, irrespective of what that turns out to be. The Legal Services division of Evolver Incorporated offers end-to-end Discovery, IT and Cyber Security solutions to law firms and corporations. We also offer specialty tools for project management and reviewing structured data and Excel files. Evolver has nearly 300 employees and is headquartered in Reston, Virginia with offices in Denver and San Francisco. For more information: http://www.evolverlegal.com.